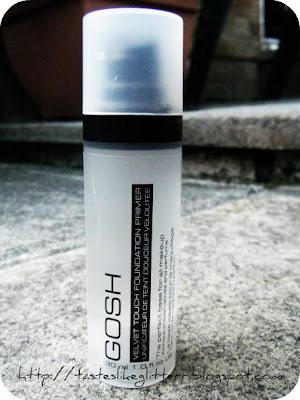 Almost 2 weeks ago I posted this blog on the GOSH Velvet Touch Foundation Primer. Now I’ve finally had a chance to use it and not breakout (luckily!) I can review it. GOSH Velvet Touch Foundation Primer is a perfect base for all make up. It fills in fine lines and deep pores in the skin, creating a uniform, matte and silky soft surface, enabling the easy and smooth application of foundation. The primer can be used after daily moisturiser or on clean skin. The formula is perfume and preservative free. I was super excited to try this because the packaging is so so much better then M.A.C’s Prep + Prime Face, much as I love that it can be slightly greasy but I’ll go into that in another post, when I compare the two. At first I thought this was almost identical to the Matte Gel from M.A.C. It’s a clear gel but it’s not super thick, so easily absorbed into the skin. Which is good. I don’t want to be waiting around for my face to dry. It does leave the skin really smooth and more importantly, matte. I don’t know what it is but I hate any kind of shine on my face. I just can’t stand it. Matte all the way so this is the perfect primer. The only problem being is it has no SPF what so ever. I think I’ll be using this more in the colder months and going back to M.A.C in the summer because I really want that face protection. I would definitely repurchase though because the packaging is also a lot better. It's air tight and the thing at the bottom (I don't know what you call it?) pushes the primer up so none is wasted.